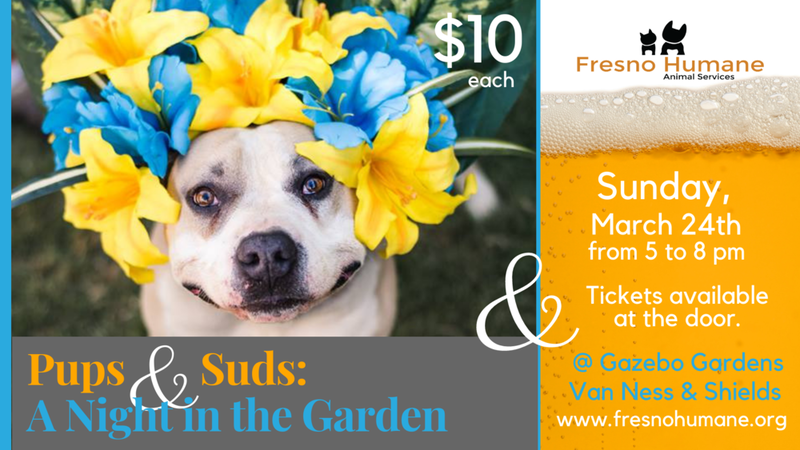 Pups & Suds is our bi-annual fundraiser at Gazebo Gardens just north of The Tower District in a beautiful garden offering food trucks, beer & a dog adoption showcase and Spring fashion show by Chico's Women's clothing. Thanks to our sponsors, we offer an enjoyable evening of music by DJ Rey with a great social atmosphere with dogs, dogs and more dogs! Yes, you got that right! You can bring your dog-friendly pets on a leash with a poop bag at the ready. They want in on the fun too! Pups & Suds offers a raffle table with plenty of toys, treats and swag that you can win for your doggo! We all know you adore your pooch why not show them off to your friends at this easy-going event! Did we mention there is a catwalk? Dress up your pooch in the cutest spring-themed attire and strut your mutt down the catwalk for a chance to win prizes! Make sure to take pictures, video, and #fresnohumane & #pupsandsuds! El Premio Mayor will be on-hand offering all the Mexican food you love: tacos, burritos and quesadillas. WTF: Where's the Food will be offering yummy Asian inspired food fair and a variety of beer will be available for purchase from Gazebo Gardens. Snocafe will be handing out their flovared-ice delectables for purchase along with a special doggy flavored sno-treat that benefits FHAS. Don't miss out! Tickets: $10 at the door & friendly leashed pets are welcome. 3204 N. Van Ness Blvd. Come show support for Fresno Humane's medical fund offering lost, injured pets access to life-saving surgeries and medicines. Fresno Humane is grateful to our Pups & Suds sponsors who make this wonderful event possible! Gold Level Sponsors: Whitie’s Pets, The Toby Team - The Mortgage Professionals & Gazebo Gardens. Silver Level Sponsors: Valley Children’s Hospital, Outfront Media, DJ Rey Martinez & It’s My Party Rentals, & Chico's Women's Clothing.